Memorial Day Weekend is always a well celebrated holiday and is considered the unofficial kickoff of summertime in America’s heartland. And this year, Insomniac Events is throwing the party. Electric Daisy Carnival (EDC) Chicago will takeover the Chicagoland Speedway in Joliet, Ill. May 24, 25 and 26, 2013 for a celebration of dance music and the passionate, loving community that surrounds it. The musical lineup features legendary names like Above & Beyond, Armin Van Buuren, Avicii, Benny Benassi, David Guetta, Eric Prydz, Fedde Le Grand, Ferry Corsten, Hardwell, Kaskade, Morgan Page, Sander Van Doorn, Sebastian Ingrosso, Tritonal, W&W and so many more. See the full lineup here. In addition to music, the festival includes hundreds of theatrical performers, carnival rides (included in ticket price), massive art installations, and mind blowing special effects across multiple stages. EDC Chicago is also the first and only to offer onsite camping so you can spend your time enjoying the experience instead of sitting in traffic each day. Electronic Midwest, together with Emazing Lights, iHeartRaves, and EDMcalendar.com is giving you the chance to win a party five-pack of tickets to EDC Chicago and festival merchandise to help you celebrate the unofficial kickoff of summertime in the Midwest. Must be 18+ to enter. Deadline to enter is Tues., April 30 at 11:59 p.m. CDT. We’ll notify the winners via email shortly after. One submission accepted per person. Good luck! 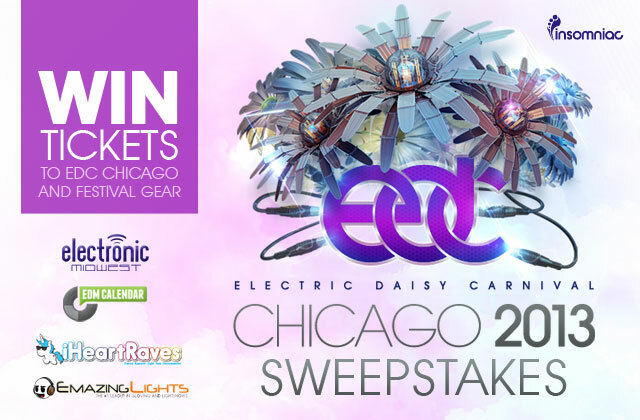 By entering the EDC Chicago Sweepstakes, you agree to our Contest Rules and to receive occasional emails from contest sponsors.